This article is about the school in Manhattan. For the school in Los Angeles, see Buckley School (California). Buckley School is an independent, K-9 day school for boys located on the Upper East Side of Manhattan, New York City. The school has three divisions: Lower School (K-3), Middle School (4-6) and Upper School (7-9), with a student body of approximately 370 pupils and 90 faculty and staff members. The headmaster is Gregory J. O’Melia, a graduate of Westminster School, CT and Harvard University, and is the sixth headmaster to be appointed since the school's founding in 1913. Buckley is a member of the National Association of Independent Schools, the New York State Association of Independent Schools and the International Boys’ Schools Coalition. Additionally, it is a charter member of the Manhattan Private Middle School League and the Metropolitan Private Middle School Track and Field Association. 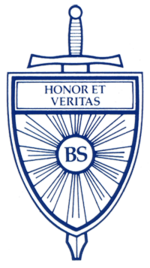 The school’s motto is “Honor et Veritas” (Honor and Truth), and its official seal is a shield. B. Lord Buckley, a professional educator, founded Buckley in 1913 as a boys' elementary school with the aim of offering a classical curriculum. The original school was located above a milliner's shop on Madison Avenue. In 1917, the school moved to a larger building on East 74th Street. In the late 1990s, Buckley purchased a townhouse on E 73rd Street to house the Walsh building, its main school. The 74th Street Hubball building continues to be a part of the school and houses Beginners classrooms and athletic facilities. In 2014 two townhouses were purchased on E 73rd Street to serve as the school's Arts and Sciences building. Five headmasters have succeeded B. Lord Buckley: Evelyn Adams (1932-1940), James Hubball (1940-1972), C. Brett Boocock (1972-1982), Brian Walsh (1982-2001) and its current headmaster, Gregory O’Melia (2001–present). Buckley offers a wide range of athletic activities. Cross country, football and soccer are offered in the fall; basketball, gymnastics, strength training and wrestling are offered in the winter; baseball, gymnastics, lacrosse and track compete in the spring. Every year, varsity football teams from Buckley and a rival, the Allen-Stevenson School, compete in a match known as the East Side Bowl. The winning team takes home the East Side Cup. The Buckley varsity wrestling team competes in the King of the Ring Tournament every year. In 2012, they won the league championship for the 25th consecutive year. Field Day takes place at the end of the school year on Randall’s Island. Boys in every class compete in traditional track races as well as fun events, such as tug of war, sack races, egg relays and the obstacle course. Mad Men character Pete Campbell is portrayed as an alumnus, as well as of Deerfield Academy and Dartmouth College. The Bonfire of the Vanities's Shermon McCoy is portrayed as an alumnus, as well as of St. Paul's and Yale. Alumnus Michael C. Rockefeller was presumed eaten by sharks or saltwater crocodiles or captured by natives in the Asmat region of Papua New Guinea. ^ "David Rockefeller Jr.", South China Morning Post, December 11, 2011. ^ Schuster, Dana (December 11, 2016). "Supposedly tolerant NYC is making the Trump kids' lives 'horrible'". New York Post. Retrieved 6 August 2017. ^ Brenner, Marie (September 1, 1990). "After The Gold Rush". Vanity Fair. Retrieved 5 August 2017. ^ Darrach, Brad (February 16, 1987). "Could They Get Away with Murder?". People. Retrieved 9 January 2018.